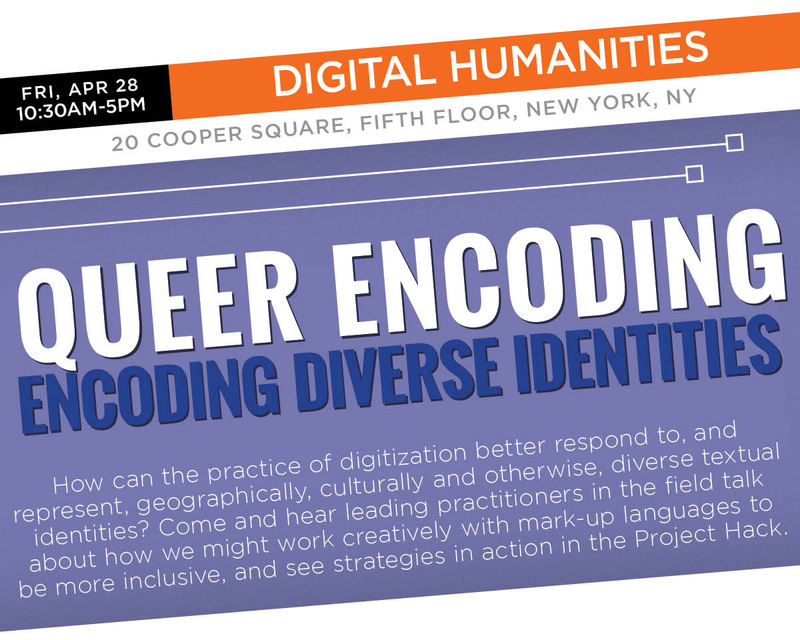 During the last week of April, the Digital Scholarship Center live-streamed Queer Encoding: Encoding Diverse Identities, a conference on the Text Encoding Initiative (TEI). Co-sponsored by the DSC, the conference was held at NYU and included morning presentations by Temple faculty, including an introduction by Peter Logan (Professor of English; Academic Director of the DSC) and keynote by Marcus Bingenheimer (Assistant Professor of Religion). Other presenters included Marion Thain (Associate Director of Digital Humanities, New York University), Julia Flanders (Digital Scholarship Group Director and Professor of the Practice of English, Northeastern University), and three groups of graduate students working on TEI Projects. Markup languages typically follow strict formats and schema to identify data in texts, yet do not necessarily reflect the complexities inherent in culture and identity. These presentations probed different ways textual scholars can use markup languages more creatively to acknowledge and record diverse or ambiguous identities.